Imagine an authoritarian nation where everyone has a phone running a government-customized version of Android — indeed, is required to have one, because every phone is an eye and ear of the national surveillance network. … Right now, carrier bloatware and device control is just an irritation, but look just a little ways into the future, and it’s worryingly easy to envision it actually becoming a serious human rights problem … especially if Western companies keep on selling their oppression technology to all comers. 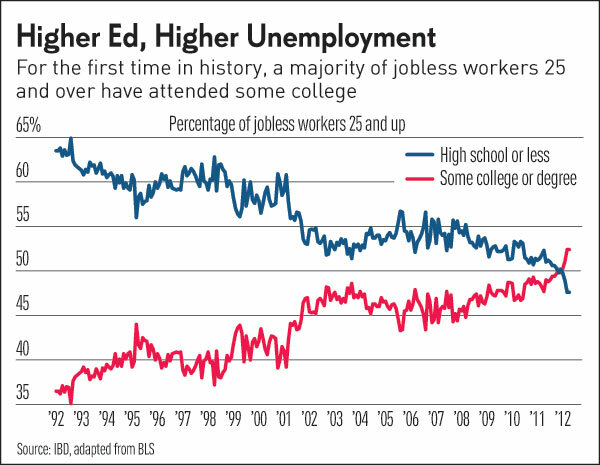 For the first time in history, the number of jobless workers age 25 and up who have attended some college now exceeds the ranks of those who settled for a high school diploma or less. How much of this is simply because of the rising percentage of college-educated US adults? CNET has learned that the FBI has formed a Domestic Communications Assistance Center, which is tasked with developing new electronic surveillance technologies, including intercepting Internet, wireless, and VoIP communications.